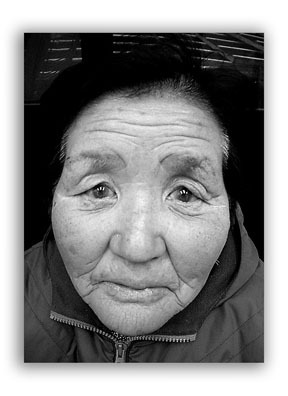 Each of these pictures of the elderly reveal an aspect of the subject's personality. The character lines that old people develop as they age add a uniqueness to their faces. Getting old is something that many of us hope to experience. It beats the alternative, if you know what I mean. Yet, the elderly are often not appreciated. 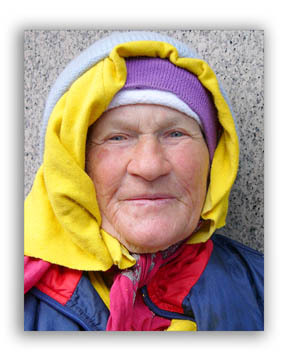 Our western society overvalues smooth, wrinkle-free skin. When you look at photos of the elderly, remember that there is a little kid in all of us. 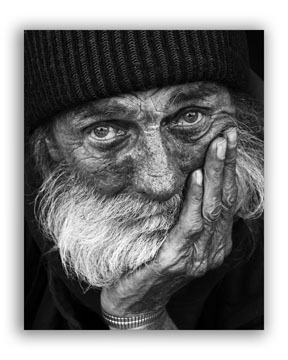 Black and white photography has an emotional impact on pictures of the elderly. 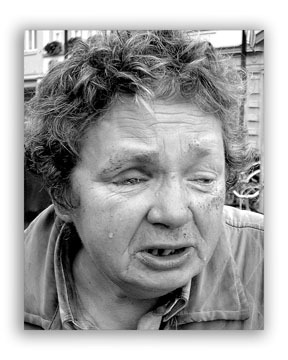 This tearful photo of this woman is not a photo that will induce a warm fuzzy feeling when you view it. Genuine emotions were captured when it was taken. This is okay provided the photo is not demeaning in any way. Note the feeling you get from viewing the black and white photos. Now look at the color images below. It is a completely different effect. That's why its so important to decide if you want to have color in your photograph or not. I love the innocent look of this woman in the picture on the left. There is such an honestly about her eyes. The looking up perspective was created because the camera was higher than the subject. This is a good angle to use to have the eyes appear full and round to the camera. The various splash of colors of this woman's clothing help create a very pleasant composition. Solid colors are less distracting than stripes and plaids. I picked these 6 photos of old people after looking at hundreds of photographs. The all convey different emotions. The internet has opened a huge vault of humanity to each one of us. The ability to share photos of any person or any place in the world with any person in any other place in the world is amazing. The planet has become so much smaller. Hopefully this new level of communication can lead to more peace among all who inhabit the earth. 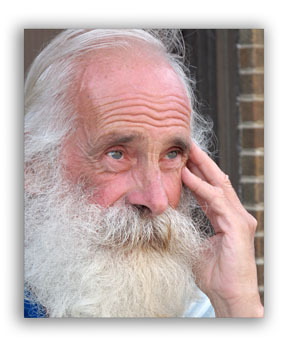 This photo of the white-haired, bearded man forces us to interpret his emotion by studying his eyes. His facial hair hides his mouth from us. Can you guess what he is thinking? These unique pictures of the elderly remind us to appreciate the diversity in mankind. If we were to view each one of these individuals as babies, would they look as different? What a better world we can make! 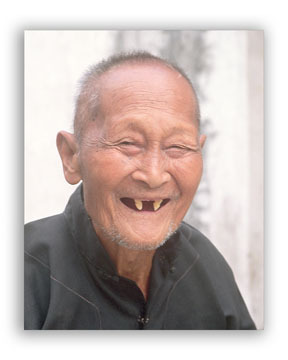 Pictures of Senior Citizens. More sample photos and some photography tips on lighting and composition when taking pictures of senior citizens. Black and White Photography Portrait. 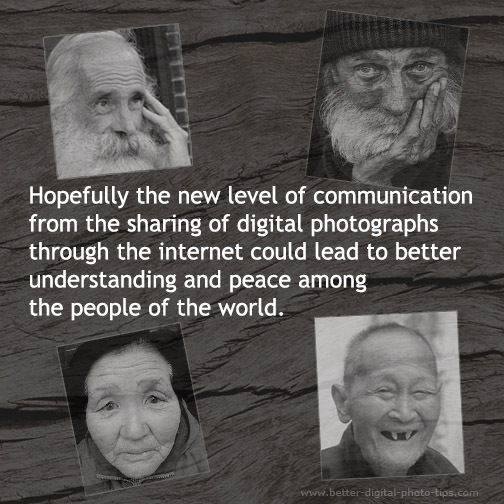 More thoughts and direct comparisons on why black and white photography is the best choice for photos of old people. How to Photograph People. Tips on how to photograph people that you know and that you don't know before you take their photo.